Elegantly hand-crafted, our red and white centerpiece is the picture of beauty. Fresh roses, lilies, spider mums, carnations and daisy poms in shades of red and white add classic style wherever it goes. 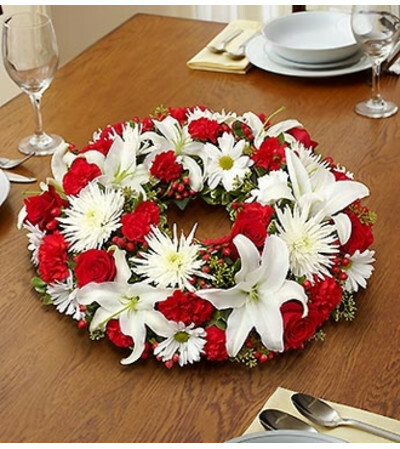 Stunning centerpiece in red and white blooms such as roses, lilies, spider mums, carnations, daisy poms, hypericum and mini carnations, gathered with variegated pittosporum and seeded eucalyptus.